1. Roast all the ingredients except coconut in a pan. 2. Add coconut and grind. 3. 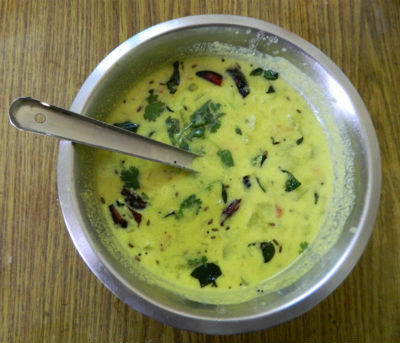 In a deep pan combine the cooked dal, yogurt, green chillies and radish over moderate heat. 4. Add the ground ingredients and stir well. Add salt and turmeric powder. 5. Heat mustard seeds in little oil and pour over the kuzhambu as soon it starts to splutter. 6. As soon as it starts to boil, remove from heat. Feel free to comment or share your thoughts on this Mullangi Mor Kuzhambu Recipe from Awesome Cuisine.